CORNER BROOK, N.L. — It took a couple of extra days, but the end result was the same for Manitoba’s Braden Calvert. A year ago in Liverpool, N.S. 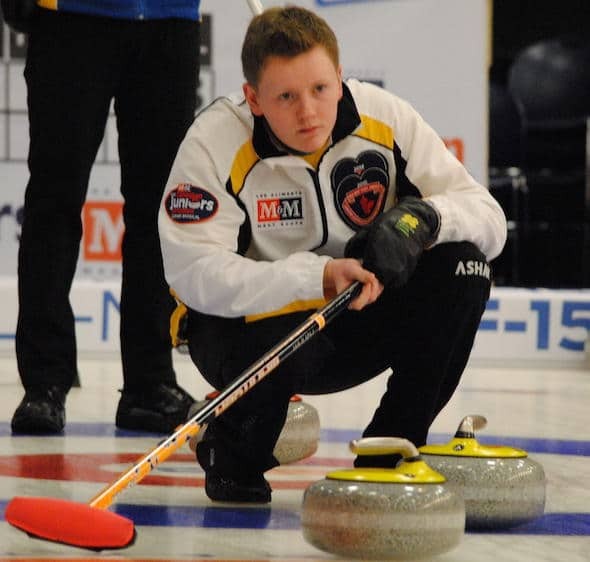 , Calvert’s team from Winnipeg — third Kyle Kurz, second Lucas Van Den Bosch, lead Brendan Wilson, coach Tom Clasper — had first place and a bye to the men’s final of the M&M Meat Shops Canadian Junior Curling Championships locked up by Wednesday night. 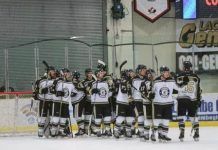 Calvert and Co. would turn that bye into a gold medal with a win over New Brunswick’s Rene Comeau. Fast forward to the 2015 renewal of the M&M Meat Shops Canadian Juniors, and Calvert’s Manitobans are in a familiar position, albeit two days later than last year, thanks to a 7-3 win over Alberta’s Karsten Sturmay (Edmonton; 7-3) on Friday morning at the Corner Brook Civic Centre — a victory that locked up first place with a 9-1 record, and a trip to Sunday’s gold-medal game at 8 p.m. (all times NST; EST plus 90 minutes) on TSN/RDS2. His opponent won’t be known until after Sunday’s 1:30 p.m. semifinal, and the two tiebreakers that will precede it to determine the third and final playoff qualifier. Today at 1:30 p.m., Alberta plays Quebec’s Félix Asselin (Montreal); the winner will then take on Saskatchewan’s Jacob Hersikorn (Saskatoon) Saturday at 1:30 p.m. after all three teams finished with 7-3 records. In the meantime, Calvert’s team will chill out and follow much the same formula it did last year en route to gold in Liverpool. Manitoba is bidding for its third straight Canadian junior men’s title (Matt Dunstone prevailed in 2013 in Fort McMurray, Alta.) — a feat that hasn’t been accomplished since Saskatchewan did it twice in a seven-year stretch (1951 through 1953; 1955 through 1956). Also, Calvert is hoping to win back-to-back Canadian junior men’s gold medals to join an elite group of skips that includes Charley Thomas (2006, 2007), John Morris (1998, 1999), Bayne Secord (1954, 1955) and Gary Thode (1951, 1952). Saskatchewan moved into the tiebreaker picture thanks to an emphatic 12-4 win over Ontario’s Mac Calwell (Belleville; 2-8); while Quebec missed a chance to qualify outright for the semifinal, bowing 6-4 to Northern Ontario’s Tanner Horgan (Sudbury; 5-5). On the women’s side, the playoff picture is clean: defending world champ Kelsey Rocque (Edmonton; 9-1) is through to Saturday’s 8 p.m. final on TSN/RDS2, while 2013 champion Corryn Brown of B.C. (Kamloops; 7-3) will play Ontario’s Chelsea Brandwood (Hamilton; 7-3) in the semifinal Saturday at 1:30 p.m. on TSN/RDS2. 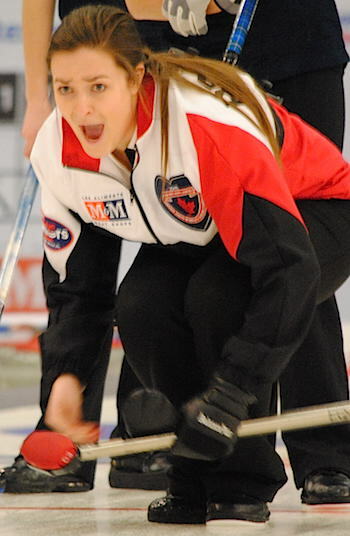 Brandwood nailed down her semifinal berth with a dramatic 7-6 extra-end win over Nova Scotia’s Mary Fay (Chester; 6-4) in the game that determined the third playoff qualifier. Brandwood had a chance to win in the 10th but was heavy with her last-rock raise attempt, and then had to settle her nerves in the 11th to make a delicate outturn tap on a half-buried Nova Scotia counter. 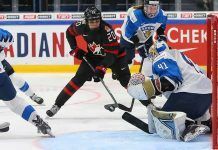 Alberta, which locked up first place on Thursday night, closed out its round-robin schedule with an 8-7 extra-end loss to New Brunswick’s Justine Comeau (Fredericton; 6-4). 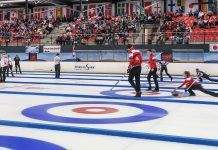 Action at the 2015 M&M Meat Shops Canadian Juniors continues on Friday the final round-robin draw in the Seeding Pool, at 12:30 p.m., and the men’s tiebreaker at 1:30 p.m.